Successfully Added Discovery 1080P SuperHD Video Camera (5x Optical + 14MP CMOS) to your Shopping Cart. 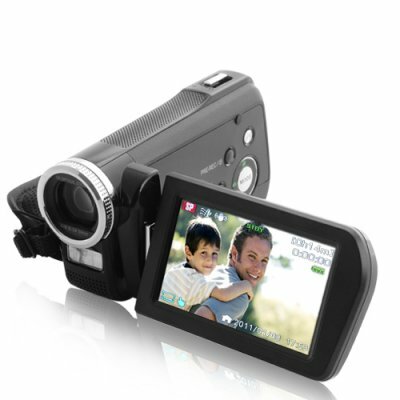 Our top of the line digital camcorder, The Discovery has it all: 1920 x 1080 video resolution (1080p), 5x optical zoom, 3 inch touchscreen display, true 14 megapixel photo quality, and support for SDHC cards up to 32 GB. If you like playing with power, you're going to love the Discovery! Want to create amazing high definition videos which are perfectly compatible with your 1080p big screen TV? The Discovery shoots and captures video in 1920 x 1080 resolution which is identical to the resolution of your plasma or LCD large screen TV - in fact, 1080p is a short for 1920 x 1080 pixel resolution! Capture live sporting events, unforgettable concert performances, or maybe even try directing your first feature film with this first class video camera. When you're done, simply attach one end of the HDMI cable (included free) to The Discovery and the other end of the cable to your large screen TV. Hit play on the camcorder and you're watching videos in full high definition glory! One camera for both video and still photo: Instead of carrying a camcorder in one hand and a digital camera in the other, The Discovery is everything you need for amazing videos and photos in one convenient palm-sized wonder! Switch between either shooting 1080p videos and taking real 14 megapixel photos with a single button press. The benefit to you: record your daughter's entire violin recital for posterity, but also snap a few precious pics for your screen saver or desktop wallpaper! Most importantly, The Discovery is incredibly easy to use. Think of it like the iPhone of camcorders. Buttons are where they should be. It features Electronic Image Stabilization (EIS). You've got access to 5x optical zoom and 14x digital zoom which gives you access to 50x zooming power. It comes with a 3 inch touchscreen display which allows you to see what you're filming and also configure your settings with ease. Everything you need for a great point and capture experience is included so you can start making beautiful memories right of the box! This Top Of The Line Video Camera will start saving you time and money from the moment you start using it. It makes a great addition to internet storefronts, webshops, and dropshippers that like to deal with small business customers. Feature it on your new product page to generate some new sales and nice profits while helping a small business become more self-sustaining and efficient. Available in our warehouse right now, so place your order today and we will ship it out tomorrow. Shutter Speed: 1/2000 sec. - 1 sec. Records 720p videos at 60 frames per second! 14 MP CMOS Sensor for incredible quality every time! Yes, the unit has a built in screw -slot to attach to a standard tripod mount. Yes, this product can give entry level DSLR cameras a run for their money.